How have you fared over the past week? Are you in the part of the country that faced bitter cold for days, then saw the temperature rocket up into the fifties? We are. But oh, boy. That was some snow and cold! Those shivery days made me so happy to be at home, curled up in front of the fireplace with our house pups--who did not linger at all during their very brief trips outside. I felt so sorry for the squirrels and birds outside--we went through a LOT of suet, sunflower seeds and mixed seed for those poor creatures. This little guy (and his much bigger, fatter friends) came back again and again. He was shivering and holding his little paws against his belly when he stopped to watch me through the window. 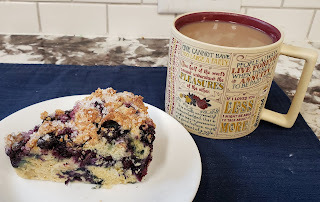 I love to bake, and the weather seemed like a perfect time to make something warm and comforting, so I made a batch of blueberry scones. Coffee always tastes better in my Jane Austen mug. :) I've probably read all of the sayings on it at least a hundred times, but they still make me smile. I posted the scone recipe on my Facebook profile a bit ago, but I will share it with you, too. I make these in a Nordic Ware scone pan that has dividers for each scone, so they come out perfectly. 1/2 cup COLD regular (salted) butter--not margarine! Cut butter into flour until you have large crumbles. 1 1/2 cups fresh blueberries. The mixture will seem very dry and crumbly. Try to press it together a bit ( it is not going to be a smooth cohesive dough at all!) Don't overwork it. Pat into the scone pan (you might not believe it at first, but yes--it will all fit!) or into a 9 inch round cake pan. The crumbly dough is hard to work with, but will result in a nice bumpy top. Sprinkle heavily with sugar (coarse, large grain sparkling sugar if you have it is so pretty!) and bake 375 degrees for 20-25 min, let cool in pan. *NOTE: I have only used the liquid buttermilk for this recipe, not the buttermilk powder plus water, so I'm not sure how the powder would work. This could nice for breakfast or brunch on Valentine's Day! Sounds wonderful! How cold does it get, where you are? Have you had any of the crazy stormy weather this fall and winter, or does that go farther up the coast? I love scones. Thankfully it didn't get below 15 degrees.